The Spell has been Broken! The Undefeated Tomahawks' Spell was broken by the Suns' Lightning in a match where the Hawks never saw the lead. 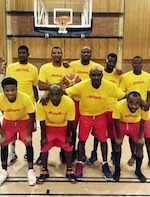 Suns' Mpume H had 40 points (4 dunks), followed by Eric N with 19 (2 dunks) and Coulson J with 14. On the loser's side, Paulo C had 31 points (2 Dunks), followed by Luis A (3 Dunks) & Freddie A with 16 points apiece. The Clear Essence Pretty Boys, had a not pretty response to Blues' BD da Silva's dirty game, engaging a fight that caught the eyes of the KBA Officials. It was the third game that the Blues lost by one point and this time it was BD that missed that last free-throw that would keep them in the Playoffs' Race. Titan Vivien R scored 19 (5x3pt of which one was the game saviour shot that game the Titans the lead), followed by Paulus H with 17 (3x3pt) and Patrick G with 14.Team Captain Corbin P had 13 points at the time he fouled out.